Urging Prime Minister Narendra Modi to declare July 1 as Daughters' Day in memory of Indian born NASA astronaut Kalpana Chawla, the Public Relations Council of India (PRCI) has launched a campaign #shakti4beti. Kalpana, who had an illustrious career as a NASA astronaut, died along with six crew members of the Space Shuttle Columbia, which disintegrated over Texas during its re-entry into the Earth's atmosphere, just 16 minutes before landing. July 1 is Kalpana's official birthday. Even after her tragic death, Kalpana continues to be a shining example and icon for many girls around the world. PRCI -- the pan-India premier body of PR, Media, Advertising, HR professionals and mass communication academicians -- embarked on a social media campaign to focus on communicating on the importance of girl security, culminating with Daughter's Day events on Friday next (July 1). PRCI has petitioned the Prime Minister and tweeted to the HRD, Defence and Railway ministers urging for their help and support for #shakti4beti and declaring July 1 as Daughters' Day. Explaining the significance of the theme, B N Kumar,national president of PRCI, said: "Beti Suraksha (girls' security) falls in line with the Union government's campaign Beti Bachao Beti Padhao. We as communication professionals firmly believe that it is absolutely important to communicate to the society at large on the issue that bothers all -- the security of the girl child". "The memory of Kalpana Chawla, whose glory grew sky high, remains as an inspiration and we as communicators are keen to ensure that the GenX remembers with a sense of pride," said M B Jayaram, Chairman Emeritus and Chief Mentor of PRCI. "We at PRCI observe July 1 as Daughters' Day each year and now we have urged the Prime Minister to declare it as a National Daughters' Day," he added. PRCI has also launched a Twitter and Facebook campaign to focus on communication about girl safety and security, and proposed to schools and colleges to initiate self defence programmes for girls. "We are happy that KJ Somaiya Institute of Management Studies and Research (SIMSR) at Somaiya Vidyavihar, Mumbai, has agreed to actively participate in the campaign. Students will be mobilised to communicate on the issue. A Navi Mumbai-based developer, Prajapati Constructions, has also given its consent to launch the drive at a school in Uran, near Mumbai," said Kumar. PRCI chapters across the country have also planned campaigns.The Bengaluru chapter planned a Beti Padhao programme. 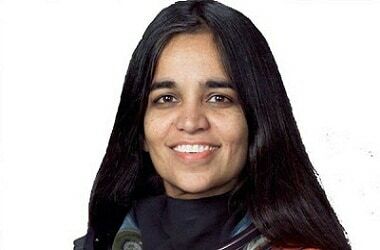 It will be a befitting tribute to Kalpana Chawla. Hats off to PRCI for this initiative to celebrate Daughters Day.